Wahweap Overlook | Analyze the Data not the Drivel. Last weekend I was in Page Arizona to visit my parents and catch the May 20th 2012 annular solar eclipse. Page is a little town that owes its existence to the construction of the Glen Canyon dam in the early 1960’s. 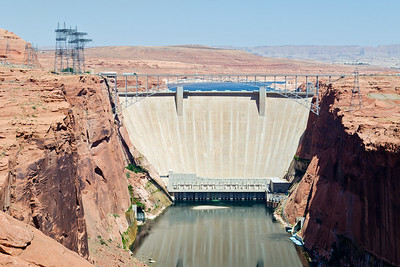 The reservoir behind the dam, Lake Powell, has appeared in so many movies that it should collect royalties. Charlton Heston crashed his spaceship here in the first and only good Planet of the Apes movie. John Travolta nuked the place in Broken Arrow. 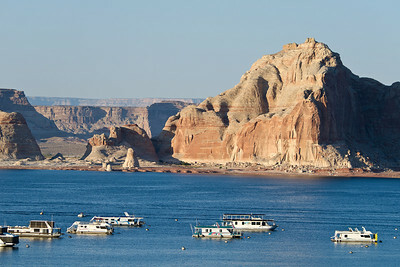 Even Jesus Christ used Lake Powell as a Dead Sea ringer in The Greatest Story Ever Told. Page, the dam and Lake Powell did not disappoint. I had a great time toodling around shooting pictures. I only had one day which was partly devoted to the eclipse but I saw enough to give Glen Canyon an unqualified thumbs up. If you’re into rocks, desert and water this place is bucket list material. Like MacArthur I will return. 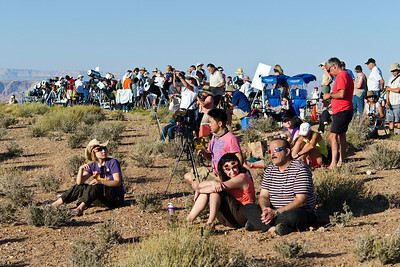 While pleased with Glen Canyon I was surprised by the large number of people who turned out for the annular eclipse. The US park service in conjunction with local amateur astronomers set up viewing grounds on Wahweap Overlook and ran full size shuttle buses from the nearby Carl Hayden dam visitor center. At least four busloads of eclipse fans were carried to the overlook where they joined more amateur astronomers and serious eclipse photographers that had set up dozens of telescopes and cameras for the big show. There must have been at least four hundred people on Wahweap Overlook and Wahweap was only one of many sites where people set up to watch the eclipse. It’s gratifying to see that when a real star puts on a show the audience is huge. Before the eclipse started, and during the early phases when the Moon was creeping on the Sun’s disk, I walked around looking through telescopes. Two scopes stood out. One expensive large aperture Hydrogen Alpha scope served up gorgeous high-resolution views of the Sun. In Hydrogen Alpha light solar prominences , filaments and photosphere mottles are clearly visible. The big Hydrogen Alpha scope put on a good show but bang for the buck went to a 15 dollar light funnel that a 14-year-old made by hand and attached to a small refractor. His makeshift funnel projected the brightest and clearest white light image of the Sun. I told him his projection was the best; he was happy to hear it. iPhone image captured by holding eclipse shades over the lens. As the eclipse approached the annular phase I set up my camera. I didn’t have the right filter, only a 4D neutral density, but I thought I’d give it a try. When the light ring formed I fired off a few shots. The filter didn’t cut enough light so I immediately gave up and went to plan B. Plan B consisted of covering the lens of my iPhone with eclipse shades and Phd’ing it. I took a few frames and managed to catch the ring. It was a minor triumph of iPhoneography. After that I just gawked through my eclipse shades while the Sun and Moon wowed the masses with their dance. The crowd burst into applause when the ring broke but, sadly, the performers declined an encore. 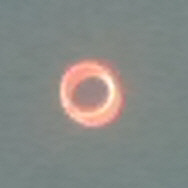 As I have already said, annulars are not in the same awe-inspiring class as totals but this annular, falling where it did, was special. From the overlook you could see the lake, the dam, towering red rock formations and of course the sky. The perfect ring of light was just the icing on the cake of a Wahweap wow!